Are you looking for special jewelry pieces? Something out of the ordinary? Well then this auction might just be for you! This auction features one lot consisting of: earrings (pierce) Silver in color w/clear stones in a flower pattern, ladies necklace stones are pearl like with 42 pearls with silver tone clasp in a box. All these jewelry items have a very high retail price but if you bid on this auction before closing time you can have a chance at winning this very special lot for an unbelievable price you wont stop raving about! If you would like to inspect this jewelry in person before deciding whether or not to place a bid then you must contact the custodian ahead of time to schedule an appointment. This auction is located in Springfield, Virginia and the closing time is on April 17 at 5:40 pm central time. Right now, the current bid is at $300 USD with the reserve not met yet and there has been 2 bidders so far so make sure that you become the next lucky person to bid and have a chance at owning this luxurious jewelry! For any further information, simply click here to subscribe to www.governmentauctions.org for your FREE 3 day trial. Are you looking to purchase new jewelry for yourself or for your significant other? Well your search just might be over because this auction has got all the jewelry you would need! This lot consists of 8 pieces of assorted jewelry. This auction has got it all! 4 watches ( 2 Citizen watches, 1 GT, 1 Polo Assn), 1 silver necklace stamped 925, 2 gold necklaces and 1 pair of earrings. Instead of going out and looking for all these pieces individually, this auction has it all in one place. All this jewelry can cost upwards of hundreds of dollars but with this auction you will be getting not one, but eight pieces of jewelry for an unbelievable deal! If you would like to inspect this lot of jewelry in person before deciding whether or not to place a bid then you must contact the auctioneer ahead of time to schedule an appointment. This auction is located in Springfield, Virginia and the closing time is on July 13 at 5:03 PM central time. Right now the current bid is $175 USD and there are 2 bidders so far, so make sure to be the very next one to win these amazing pieces! For any further information, simply click here to subscribe to www.governmentauctions.org for your FREE 3 day trial. Next up on the auction block is this great deal on some miscellaneous jewelry for both men and women. Included in this lot are the following items: 1 pair of Pearl earrings, 1 pair of Crystal earrings, 3 gold bangle bracelets, 1 gold chain link bracelet, 1 women’s Guess watch, 1 gold necklace with pendant, 2 pairs of silver/gold rings, and last nut not least a beautiful men’s Breitling Bentley watch. We strongly urge any interested parties to come in for a live preview of the items prior to bidding on them. The current asking price for this bulk auction is at $5,660 with 10 bids already placed. To find out more about this online auction simply click here right now in order to activate your 3 day free trial account! Gold Bangle: This One Is For The Ladies! If you know that it’s Christmas time, then you also know that women expect the goods. It’s not okay to just slap together a couple of gift cards…your presents need to be thoughtful. Here is where we come in. 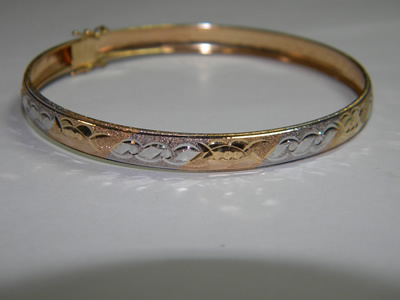 Up for auction is this 14KY bangle bracelet. This bracelet is decorated with a wavy diamond cut pattern. It has a hidden clasp and figure 8 safety locks. This is a lovely item for any woman in your life. Don’t miss out on this deal, and have to worry about running to the mall during this hectic holiday season. This item can be bid on through an online auction that is set to being on December 28. If you need more info, just click here to activate your free trial account today. 18 Karat Yellow Gold Wedding Band: And We Ain’t Talkin’ Lynyrd Skynyrd! 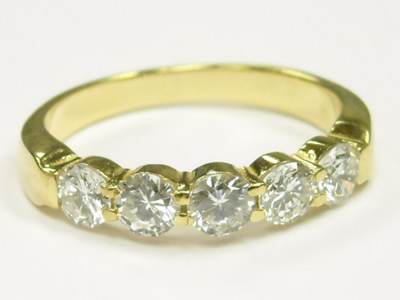 If you have already popped the question and are ready for the next step then you should take a look at this upcoming live auction that would feature a ton of different items and this very special 18 Karat Yellow Gold Wedding Band. You could probably nab this fine piece of jewelry at a good price since this is a live auction and not a retailer that would do their best to take all of your money. 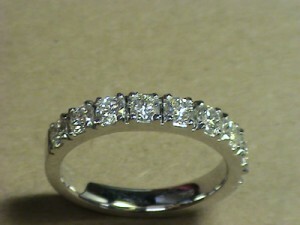 This ring features 5 round full cut diamonds and has a high polish finish. This is not the most elaborate ring but the simplicity of the design makes for a fluid piece of jewelry that would be a testament of your love for years to come. Click here for more information. Diamonds are a girl’s best friend. If you lady loves diamonds and earrings, we have a deal for you. This item could be a perfect gift for your female companion come Christmas or Hanukkah time. 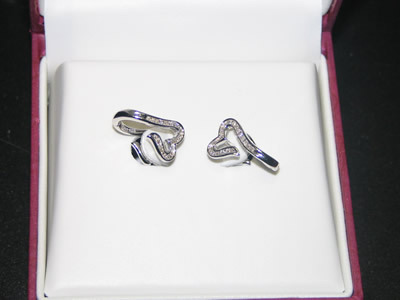 Up for auction today is a set of diamond heart earrings. The condition of these assets is unknown, but they look to be in pristine condition. These look to be white gold with diamonds shaped like a heart. Show your loved ones how much they mean to you. To get a chance to make a bid on this item, you are going to have to head over to the live auction. The auction is scheduled for November 3 on the East Coast. For all the extra details, just click here. This item right here is one that you might not ever see again. This is a piece of jewelery that looks ferocious enough to jump right out at you. 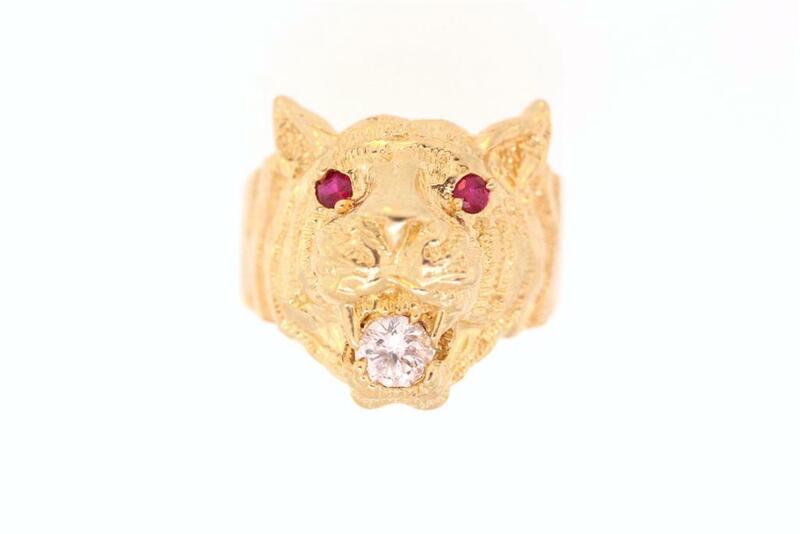 Up for auction today is a 14-karat gold tiger ring. This ring is set with two magnificent rubies for the eyes. The rubies shimmer in the lite and are the centerpiece for this ring. There is also a clear and round stone set int he mouth of the tiger. This item is only available the through an online auction. This auction is ending today, and there is only a couple hours left to made a bid. The current bid is $220. Want more details? Simply click here and activate today. 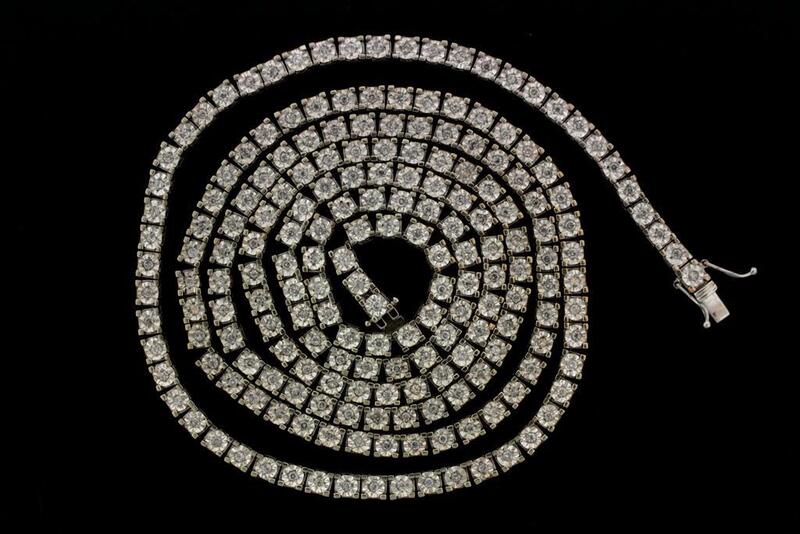 Diamond Necklace: A Coiled Snake Of Shimmering Stones! Show your female companion the true spirit of Christmas or the real joys of Hanukkah by giving her a gift that truly embodies happiness. Up for auction today is one 10-karat white gold diamond necklace. This superior piece of jewelery is set with 199 round cut diamonds. These stones sparkle in daylight. If you are looking for a piece that will truly knock people’s socks off, then this is it. Want to make a bid? Well, you can only do that at the online auction. This items goes off the auction market in less then one day. The current bid is $2000. Head over to GovernmentAuctions.org to find out all the info on this item and many more like it. Lady’s Diamond Necklace: Oh My Gosh! Let the jewelery speak for you. No words are necessary. This auction is for a spectacular lady’s diamond necklace. If you are looking for sheer beauty, this is the item for you. This could make for an unforgettable birthday or anniversary gift. The necklace has one round brilliant cut diamond. 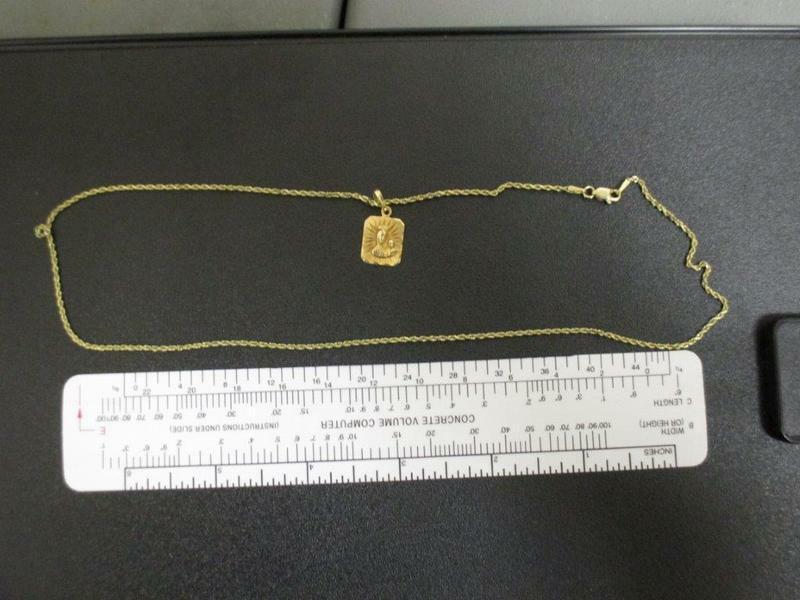 The gold chain itself is 14-karat yellow gold that lays flat against the neck. Your not a going to find a piece like this up for auction that often. This item is available through and online auction. Check it out…this piece of jewelry will end on the first of October. Make your significant other blush with excitement when she opens this magnificent piece. For more info, head over to GovernmentAuctions.org. Still searching high and low for the perfect wedding band for your soon-to-be wife? This might be your chance at that impossible-seeming task. Up for auction right now is a beautiful 14-Karat White Gold Contemporary Diamond Wedding Band with Eight Round Modern Brilliant Cut Diamonds. This ring will put a smile to any bride’s face. The band contains eight G-H Color, VS Clarity diamonds. One diamond is missing, but can easily be replaced. This ring is available at a live auction in New Jersey. The bidding begins on September 1…so get there early, and be ready to bid. Your probably not going to be the only person watching this item, so be ready for a battle if necessary. For more info on this item, head over to www.governmentauctions.org for more details. Diamond Platinum Engagement Ring: Put A Ring On It! 18K Chanel White Gold Diamond Ring: Oozing Class! 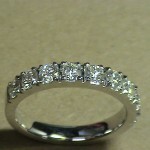 Diamond Wedding Band: When She Sees This, She’s Gonna Be The One Dropping To One Knee!